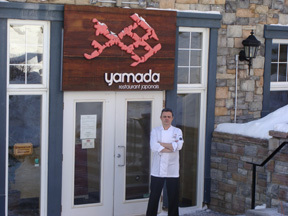 Chef Philippe Lavaud of Restaurant Yamada at Le Westin Resort & Spa Tremblant in the Pedestrian Village of Mont-Tremblant, Canada shares a delicious taste from the restaurant, where the focus is on Japanese cuisine with his two-course menu for Albacore Tataki and Kamo Yaki. Bon Appétit! Edward and I had the opportunity to get to know Chef Philippe Lavaud and his cooking style when we had dinner at the restaurant in late February 2011. 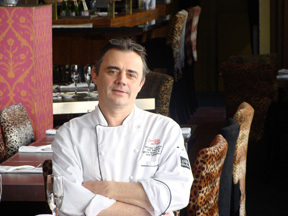 Chef Philippe Lavaud was born in France and brings an international background to Restaurant Yamada having attended culinary school in France, and later honed his culinary skills working in Australia, Japan, England, France, and Canada, and has been the head chef at Restaurant Yamada since it opened in 2006. His philosophy is freshness, everything must be fresh. He loves the smell and taste of South American cilantro, and likes to use fresh juices especially Japanese yuzu citrus juice in his cooking. He enjoys traveling to see what is new in the culinary world and has traveled to Thailand and India where he fell in love with the spices, which he uses in his cooking. He has moved away from traditional French cuisine and especially from heavy sauces and cream. He changes the menu seasonally as well as when he can obtain fresh and unique products, and was looking forward to featuring crayfish on the menu, to which the Sushi chef would also have access. With Mont-Tremblant’s close proximity to Montreal, New York, and Boston, it is very easy to obtain fresh seafood, and he likes to use local artisan cheeses and other fresh products from the Quebec region. When not working the kitchen developing new recipes, he enjoys spending time with his family, and his two sons, ages 17 and 2 years. Chef Philippe Lavaud graciously shares a delectable taste of Restaurant Yamada with his two-course menu. Bon Appétit! Method for the Cream Sauce: In a saucepan, put the shallot, white wine, and ginger, reduce till almost dry. Add cream and reduce the heat to low and simmer for 12 to 15 minutes. Season with salt and pepper. 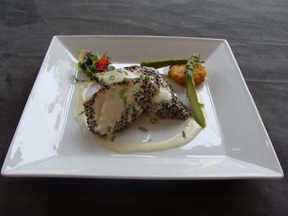 Method for the Tuna: Coat the tuna with black and white sesame seeds. Pan sear for 2 minutes on both sides. Let the tuna rest. Place the tuna on a plate and cover with cream sauce. Method: Season duck breast with salt, pepper and Chinese Five Spice Powder. Cook the duck skin side down in a hot skillet until skin is crisp and the breast is medium-rare. Method: Bring all ingredients to a boil in a saucepan, with the exception of the maple syrup. Reduce to a syrup consistency. Let rest for 24 hours. Remove onion and carrot, add maple syrup. 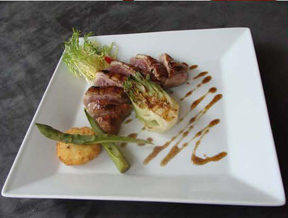 Restaurant Yamada at Le Westin Resort & Spa Tremblant is open for dinner from 6:00 pm until 11:00 pm. Read in-depth about Restaurant Yamada in the Restaurants section. Read other articles on Mont-Tremblant, Canada in the Destinations, Hotels and Resorts, Restaurants, Chefs’ Recipes (in English and in French), Spas, and Adventures sections.